Istanbul is home to Europe’s largest aquarium! Istanbul Sea Life Aquarium (former Turkuazoo Istanbul Aquarium). 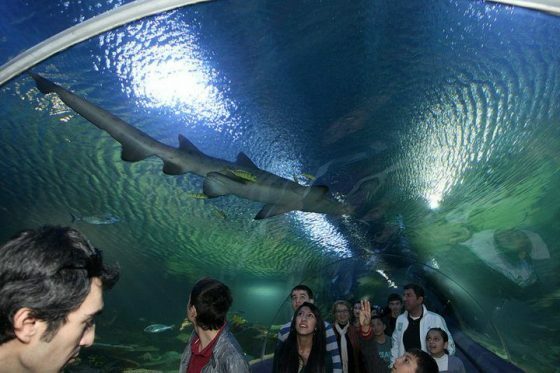 Turkey’s first giant aquarium in Istanbul opened in 2009 and is located in the new Forum Istanbul in Bayrampasa. Forum Istanbul is one of Europe’s largest shopping centers and the first shopping center in the world with a mega aquarium. Istanbul Sea Life offers family fun for those wishing to spend time in the underwater world, promising an unforgettable experience. The next-generation aquarium in Istanbul, Turkey, is designed specifically to appeal to its Turkish audience and will entertain visitors with its rainforest, flooded forest, and tropical seas zones, a predator tank and jellyfish discovery area. The exciting 90m long Marinescape SeaTube, one of the world’s longest underwater tunnels, will offer visitors a panoramic view of marine life. The concept of the site plan design of 17 million Euro aquarium project has been considered as “fish skeleton”. The total project will be 55,000 m2 big, With an impressive 7,000 m3 total tank capacity, making it the largest aquarium in Europe. The large aquarium houses 25,000 sea creatures. Among them are the 2.5-metre-long tiger sharks, as well as smaller members of the sea predator family. Brave visitors who would like to see the sea creatures not just from the other side of the glass but from up close are able to dive and swim with them. The water in the aquarium is from the Sea of Marmara, the inland sea that connects the Black and the Aegean Seas. The aquarium’s first residents were brought to Istanbul by trucks and airplanes. Istanbul Sea Life is located 5 km away from Ataturk International Airport, near the motorway and railway transportation systems in Florya, which is on the southwest coast of Istanbul where 11 million people live in. Besides, IDO sea busses have been considered for visitors, who want to reach the aquarium by seaway. These are just a few of the largest aquariums in the world where you can easily break into the mesmerizing secrets of the underwater world. World’s Largest Aquarium – Georgia Aquarium, Atlanta, a wonderful home for more than 100,000 animals of 500 different species (notable specimens: whale sharks, beluga whales, manta ray) and with a capacity of 8.1 million US gallons (31,000 m³) of marine fresh water. World’s Second Largest Aquarium – Okinawa Churaumi Aquarium, part of the Ocean Expo Commemorative National Government Park located in Motobu, Okinawa, Japan; capacity: 7,500-cubic meters (1,981,290 gallons) of water; one of the few places where visitors can see a great variety of sea creatures including sharks and manta rays. Imagine the aquarium from the video below which was shot at the Okinawa Churaumi Aquarium in Japan Kuroshio Sea – 2nd largest aquarium tank in the world. The second largest aquarium in Europe, Oceanarium in Lisbon, Portugal. The Lisbon Oceanarium has a large collection of marine species — birds, mammals, fish, cnidaria and other marine organisms. With an impressive 1,000 m2 and 5,000 m3 tank with four massive 49 m2 acrylic windows on its sides. The Aquarium of Genoa in Italy is the third largest in Europe. With an area of 10,000m2 area, 70 water tanks offering a spectacular structure and an emotional trip across the immensity of the oceans. Built for Expo 92, the Aquarium of Genoa is an educational, scientific and cultural centre. Its mission is to educate and raise public awareness as regards conservation, management and responsible use of aquatic environments. Istanbul SEA LIFE Aquarium (former Turkuazoo) is a great addition to Istanbul and a definite must for aquarium enthusiasts.